Every season has its look, and this is why there are fall hairstyles and others for different seasons. Although you can wear anything that you wish at any time, it is trendy to try and keep up with the seasons. And so as you prepare for the next fall it is important to have some ideas in mind on what to wear to look fashionable and modern. Here is a gallery of 45 hairdos that will help you choose a trendy style this fall. This style has some full bangs on the crown and tapered sides. It also has a lovely natural look, and you should pair it with full facial hairs to create a perfect bohemian look. Johnny Depp is a trendsetter, and he is always trying new looks. Here he has some textured natural bangs that he styles with moderate trimming and by simply finger combing them back to create a perfect fall look. If you prefer to maintain an extra height at the top, then this style is perfect for you. It involves leaving some long bangs on the crown and tapering the sides. You should then form some beautiful swirls with the long bangs and pair them with an extended bohemian chin curtain beard. This design is very easy to replicate because you only need to chop the ends of your medium locks to give them some texture and then style with a side part and by sweeping them sideways. The volume of these curls and their beautiful dark tone are the first things that will catch your attention. However, they also have a fantastic cut that entails tapering the sides and leaving the neatly arranged curls on the crown. This Rockabilly pompadour may be a classic, but it can still make you stand out as your fall hairdo. It is also very easy to create as you only have to maintain an extra height on the crown and make the side and back short. Curly hair is beautiful enough, and so you have to do little with it to make it fashionable. In this style, you should taper the sides and back so that they can be on the same level with the facial hairs and make the longer curls on the crown messy. Healthy natural hair like this one does not require a lot of styling to look elegant. A simple cut at the back and sides to reduce their length and a sweep back of the long wavy hair on top in layers is enough to create a fashionable hairdo. Man buns are very chic and elegant, but this one is a class higher than the others. It requires you to shave the side and back to make them shorter than the crown and then pull the strands to the center of the head and tie them into a man bun. An undercut is a good idea to spice up your looks and in this style, it helps to create an adorable, gentleman look. Apart from the faded undercut section the style also has some smooth strands at the top that you should style by brushing them back. This haircut is best suited for men who prefer formal looks and to create it you only need to leave a few inches of hair on top. You should then give the strands a side part and sweep them to the side slightly. Also, taper the sides rather than just make them short as this will produce a stylish and modern look. Giving your hair a bright tone such as the red on this style is also a good idea. However, you still need a good haircut to create the full bangs that you should design by making them messy and a faded undercut to enhance the overall appearance. You will not need to trim your strands to wear this look if they are medium length. All that you need is to push them back with your finger to create the messy look. However, this bohemian style will only be possible if you have a massive beard. It is hard to believe that this is also a Caesar cut because it does not have the traditional bowl look. Instead of the bowl look, the sides are shaved short with an eye-catching skin fade to create a disconnection with the facial hairs. Three things make this style top notch, and they are the side-part line, the taper fade and the smooth strands on the crown that you should style by sweeping them sideways. This mane may be short, but it looks magnificent, and this is not only due to its gray shade or feathered look but because of the styling. And it entails shaving the sides to create an undercut and styling the feathered mane with a simple brush back over the under shave. The fade on the sides of this hairdo is fantastic, and it makes it look very classy. However, it is not the only thing that makes this a top notch hairstyle because the curls are also very soft and neat. Shaggy locks are also very fashionable, and you do not have to do much to form them. Some like these will only need some fading on the sides and back and then style by pushing them in various directions to appear as if they are hanging over the face. Although the pompadour looks very elaborate, it is the easiest part of this hairdo the only thing that will require more attention is the fade on the sides. Apart from this you only need a side part to finish your stylish hairstyle. This hair is very natural and you will only need to do moderate trims and then style by layering the beautiful curls and make them slightly messy. The natural black tone of the hair is also fantastic, and it helps to spice up the design. This hairdo features some soft and spiky strands at the top while the sides have a beautiful fade. The other thing that makes this a perfect fall hairstyle is its lovely dark tone. Although this design looks like it does not have any styling, its cut is fantastic, and it is what makes it look charming. It entails chopping the strands short to create some short fancy bangs that you should then style by making them rugged and by layering slightly. The natural black tone of these strands is incredible, and it makes them look very healthy. 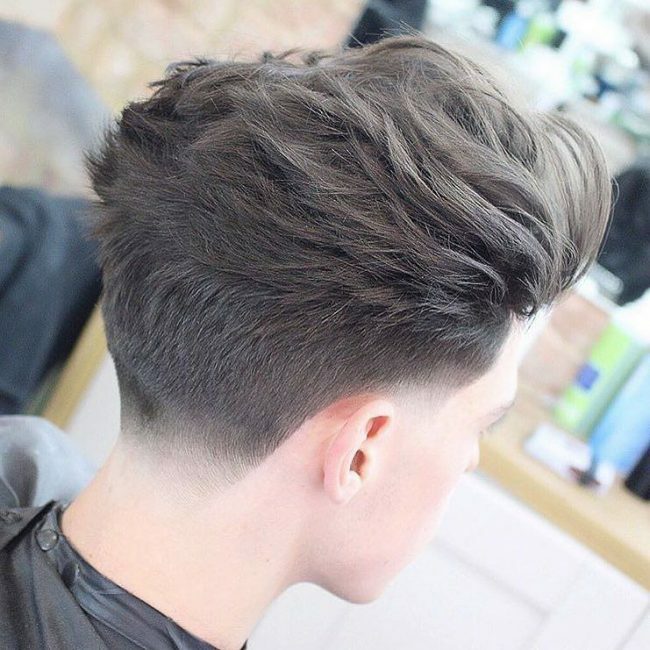 They also have a lovely haircut that entails leaving some high and wavy locks on the crown and giving the sides an excellent fade. Blonde is beautiful color and in this style, it creates an amazing contrast with the natural color of the beard. However, the blonde hair also has a lovely haircut that you can replicate by tapering the sides and leaving some chunky and messy bangs on the crown. These strands may be quite short, but they still create some lovely spikes. You should style the spikes by sweeping them to the front and finish the style with a fade on the sides. The volume of these curls is one of the things that make them stand out. They also have an inventive styling that entails giving them a sharp fade on the sides and a shaggy styling. Front swept hairdos are very trendy, and this is more so if they are short and neat like this one. And if you enhance yours with some fading or tapering on the sides you will look very exquisite. Just by looking at this hairdo you can know just how soft it is. With such a beautiful natural hair you only need to give it a simple style like making it wavy and sweeping it to one side. You should finish by tapering the sides to make them shorter than the top and to create a disconnection with the full facial hairs. If you have thick and naturally wavy hair you are lucky and you are right on trend. All you need to do is to give your hair a good lift and add structure on the top. Yes, you are ready to go. If you prefer keeping your hair very short, then you can try this amazing haircut. The waves are perfect, and the design also has geometric lines on the face that make it look very polished. The neatness of this hairdo is impressive, and it will make any man want to try it out. It is also a very simple fall haircut because you only need to slick back the short hair and give it a zero fade on the sides. To replicate this breathtaking hairdo, you should leave a couple of inches of hair at the crown and taper the sides and back. The only other thing that you need is to sweep the long hair forward over your forehead. Up sweeping hair is a very trendy and practical style because it will help some men divert attention away from the smallness of their head. This haircut maintains some medium size locks on the crown that you should style by texturing and up sweeping them. Fall hairstyles come in many shapes and sizes, and they are always changing but if you want to look trendy for the 2016 fall you have to try a fancy design like this one. However, you should also have a voluminous hair, and it entails giving it a soft side part and combing it over to the sides. Finger twists may require some skills to create but they are worth the effort, and if you are thinking of going short this fall, then you should try some like these. You should only have them on the crown and give the sides a fade. Pairing the twists with a beard is also an excellent idea. There is no effort to make these curls look neat, but this is what makes them unique. Men with curly hair and a full beard should try this look by simply messing their curls to make them appear as if they woke up that way. A quiff is a simple design with the elegance of a pompadour, but it also requires little maintenance because it is very straightforward. The one on this style also has a soft side part and distinct fade on the sides that helps to make it look very fashionable and an ideal fall hairdo. This haircut is very inventive, and this is what makes it unique. If you want to replicate it, you should start by shaving the sides short to give them an undercut and leave a long hair on the crown. To finish the design you only need to ups sweep the front locks and push the rest sideways over the undercut. Few barbers can be able to achieve a perfectly blended look like this one and so finding one might be your only difficulty if you want to wear this look. The blend between the facial whisker and the strands on the head is just fantastic, and the hard part line helps to take the look a notch higher. This haircut maintains a small section of hair on the crown while the sides have a lovely fade. However, the styling of these longer strands with a simple front and side sweep is what makes this a fabulous hairdo. You do not have to complicate anything to create a fashionable fall hairstyle. A simple haircut like this one that entails leaving long hair in the middle and styling it with a slick back and fading the sides is enough to create an upscale hairstyle. This haircut is another example of a straightforward fall hairdo that will also make you look fashionable. It entails tapering the strands on the sides and back smoothly and brushing everything back. A fringe like this one guarantees you of a fall haircut that you will want to remember for a long time. Although the strands are thin, they are arranged to perfection to create an upscale fringe that you should enhance with a classy fade on the sides. Ginger hair is lovely and also unique because this shade is not very widespread. And with such a beautiful color you only need an inventive style like the flame designs on this one, and you will have a perfect fall haircut. Here is another example of how beautiful front sweeping hair will make you look if you have some short and full bangs on the crown. You should also give the style a side part and a fresh fade below this line. Having the right haircut is one way to ensure that you enjoy your 2016 fall. And with the limitless fall hairstyles available you have no excuse of why you should not look sharp and fashionable. The 45 styles above will offer you different ideas on what you can create depending on your hair type and size.